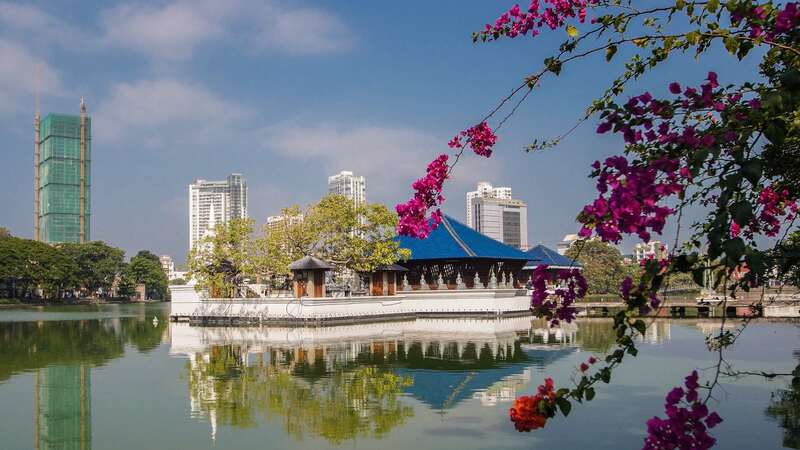 It began with a pleasant early morning walk from my guesthouse (The Wayfarers’ Inn) on Rosemead Place in Colombo’s Cinnamon Garden District. I walked along the path which traces the northern edge of a beautiful green space called Viharamahadevi Park. 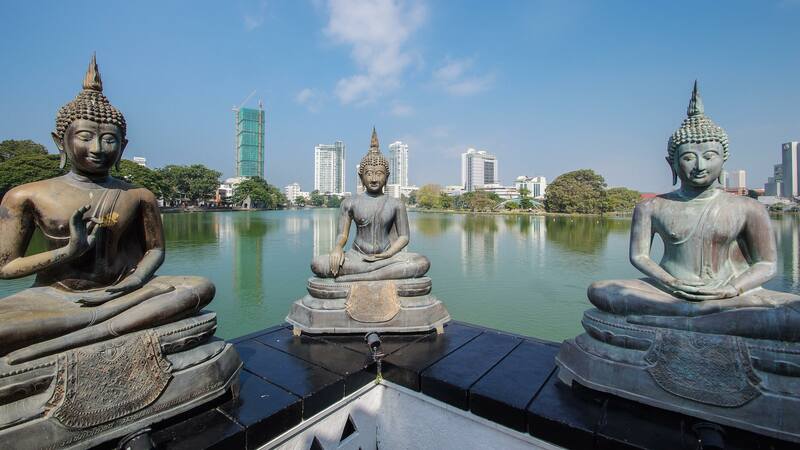 The previous afternoon I had visited the National Museum on the south side of the park; today I was headed to the Gangaramaya Vihara or Temple. 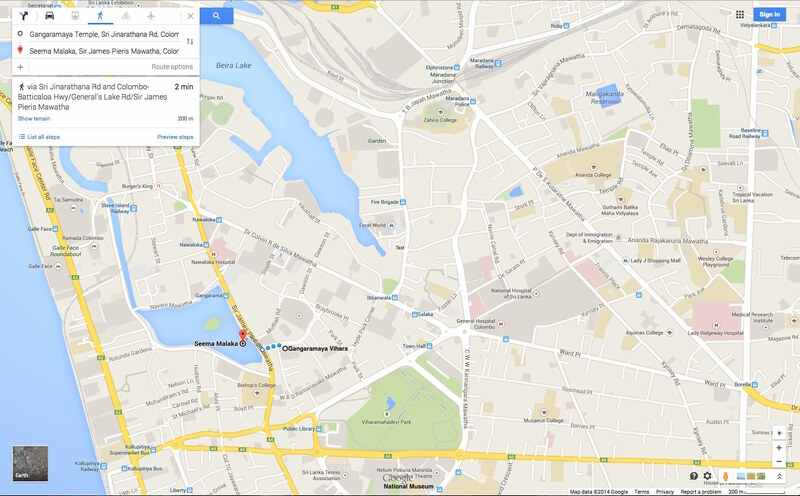 The map below will make clear my destination – the east side of the small lake just below Beira Lake. 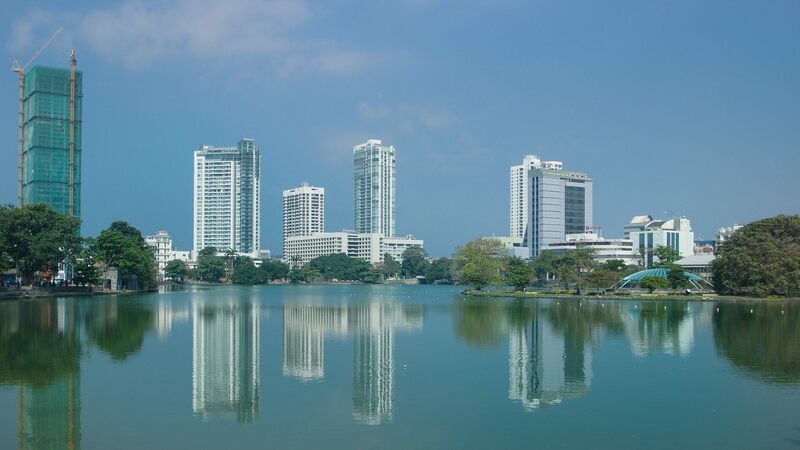 Colombo’s Fort District is perhaps 1.5 kilometers to the north and Galle Face a little less. Both seem a world away from this serene little corner of the city. 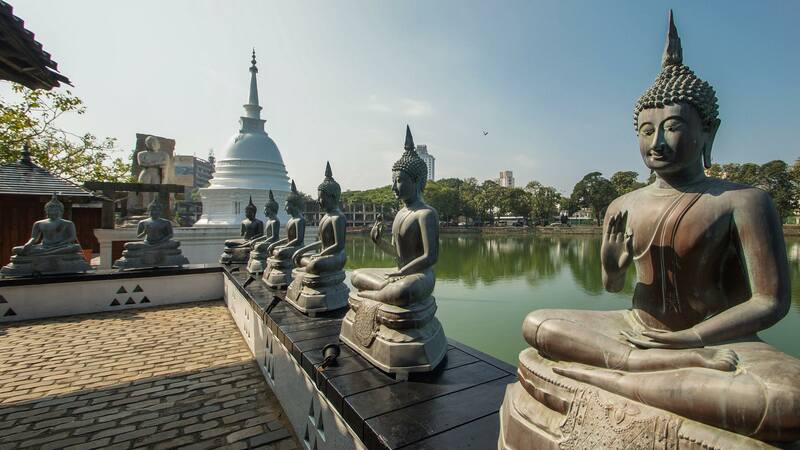 My first destination was the structure you see in the image below – a set of three pods built in the 1980’s on a design by Geoffrey Bawa, Sri Lanka’s most famous contemporary architect. 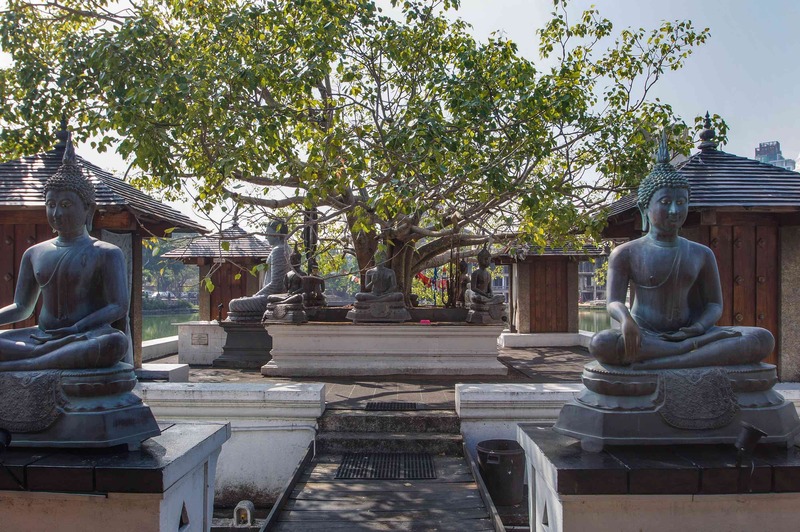 Known as Seema Malaka, this serene “island” is part of the Gangaramaya Vihara complex about two hundred meters away. 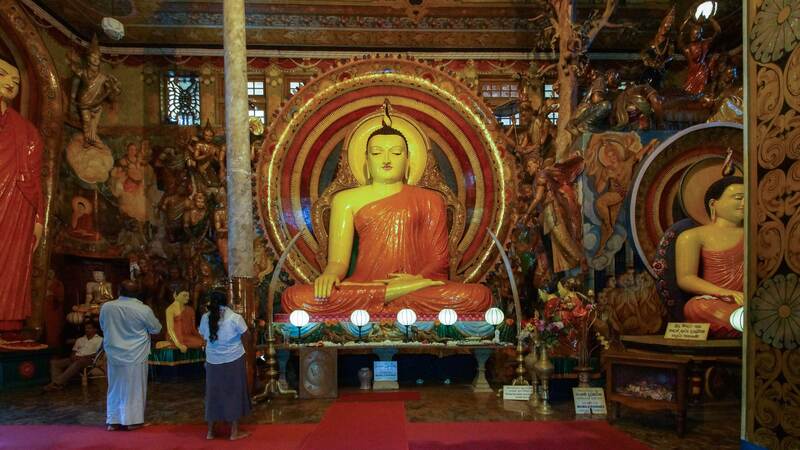 The vihara’s monks are ordained here. 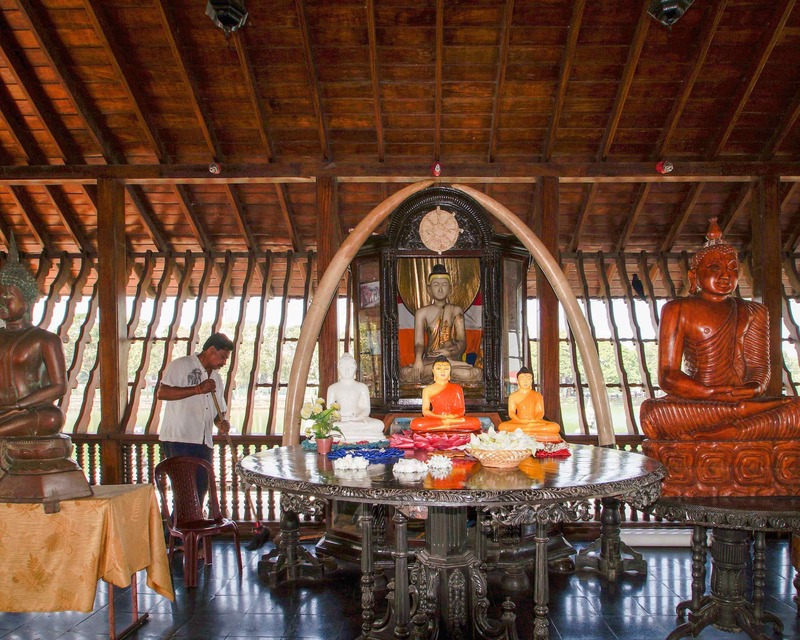 It also provides a place for other rituals as well as an everyday meditation retreat. 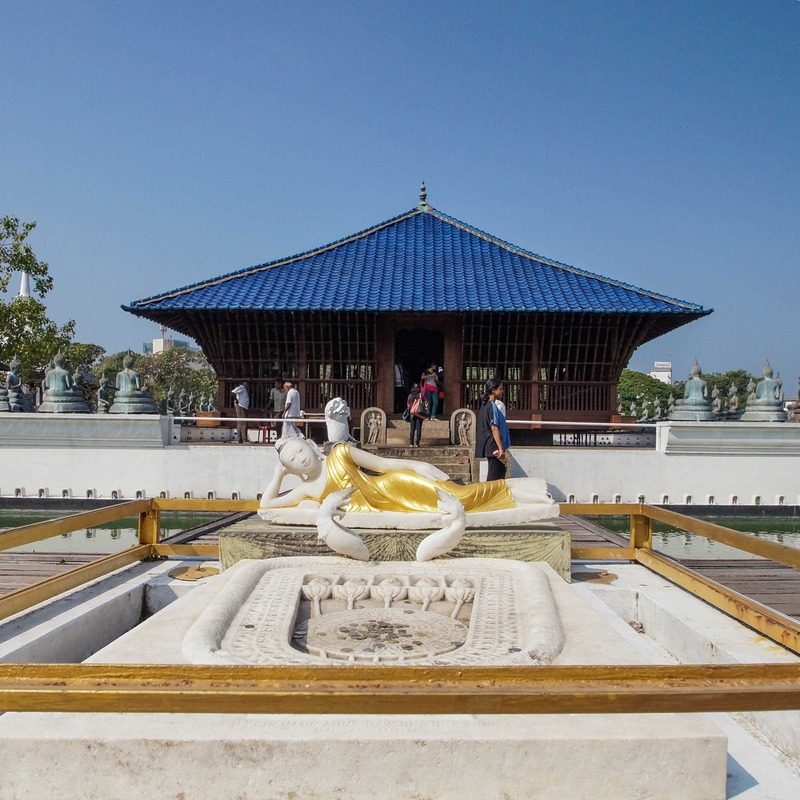 To reach the central pod, you walk across a wooden pontoon bridge past the footprint of the Buddha and the reclining Buddha figure you see in the image above. Note the coins left by merit-seeking visitors in the footprint’s indentation! 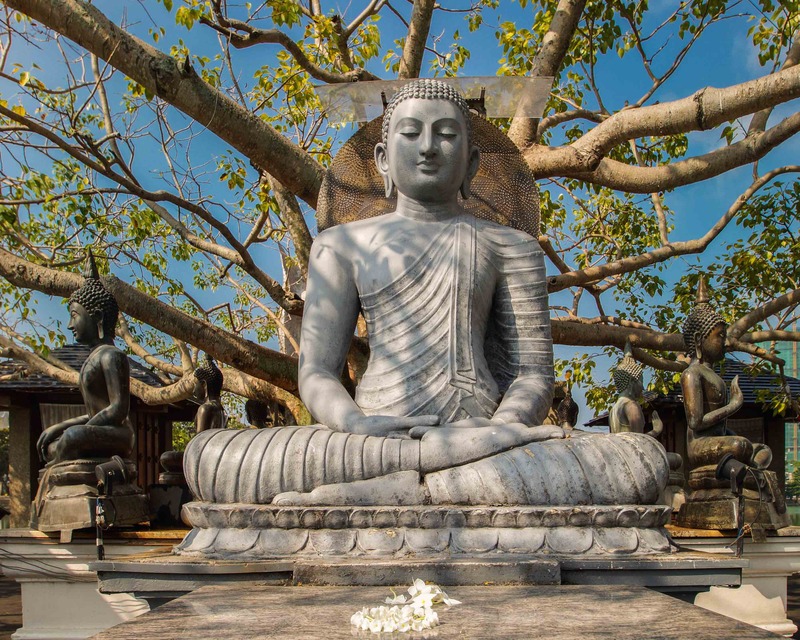 Saving a visit to the central pod for later, I turned to the left and visited the second of the pods – the one with the Bo Tree and a number of Buddha statues large and small. 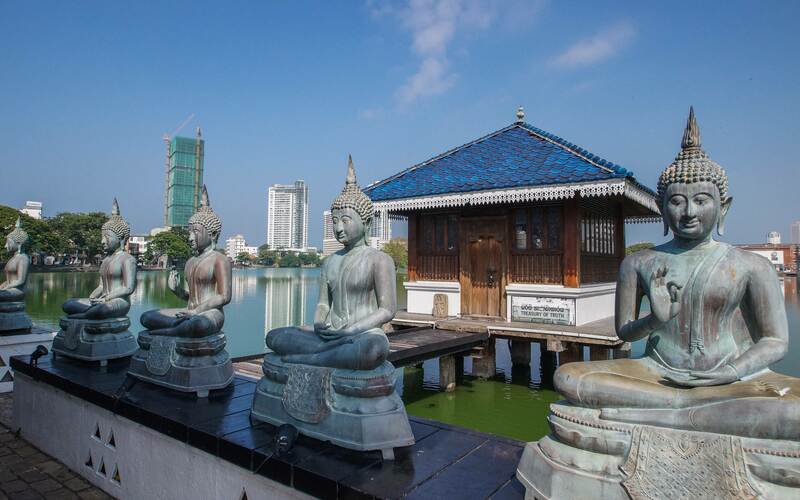 Often in my viewfinder were the bronze Buddha statues donated to the Vihara by the government of Thailand. They illustrate nicely the various mudras (hand gestures) used by Buddhist artists to convey the Buddha’s story. 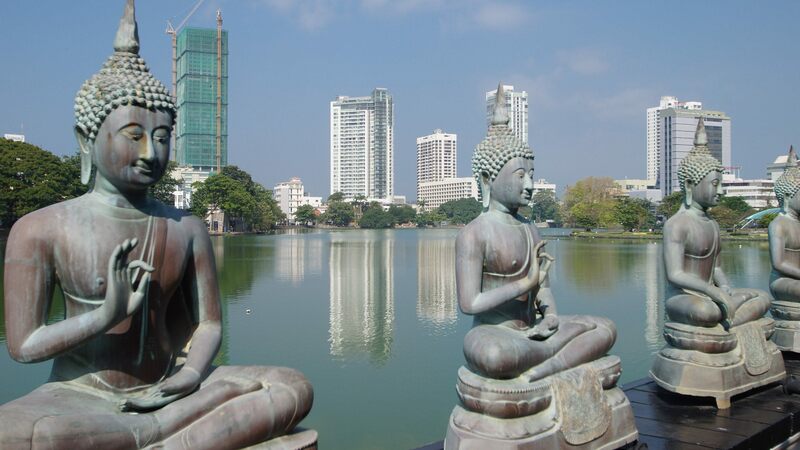 For a moment I let the various Buddhas slip from my consciousness as I looked northwest to the ring of high-rises, a sign of better economic times for Sri Lanka now that the brutal civil war that scarred a generation has ended. And then it was back to my meditation on the bronze Thai Buddha and their mudras. This spot is a serene little island that lends itself perfectly to contemplation – and photography! I was there at about 9:00 a.m.; it would have been nice to return near dusk for the very different light which a setting sun – and the lights of the city beyond – would have provided. 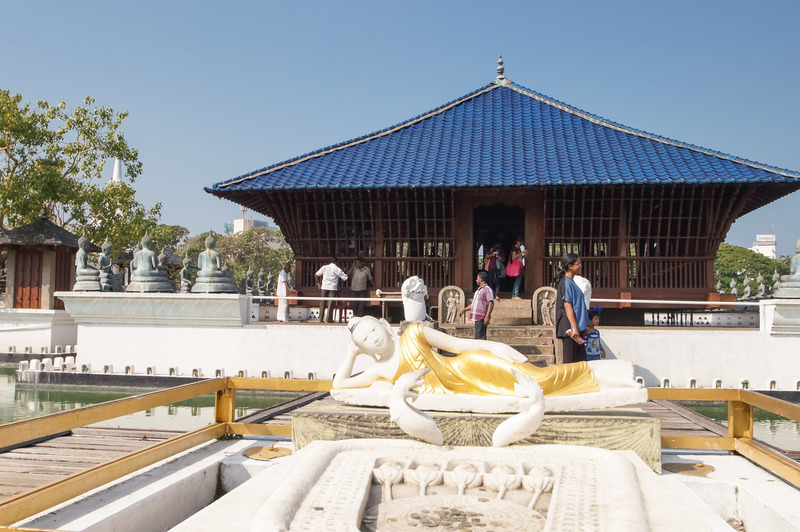 Finally, I approached the steps that lead into the main shrine room – the large building covered with the blue roof. The image below shows the moonstone and the two guardstones that mark the entrance. 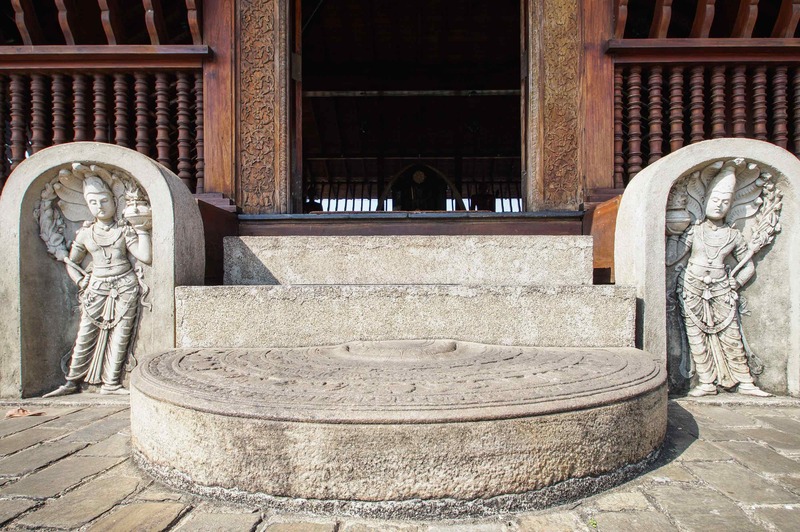 Spend any time in Anuradhapura or Polonnaruwa and you will become very familiar with these classic Sinhalese architectural touches! The fearsome Nagaraja figures, each with a halo of six cobra heads, stand guard. On the way out of the shrine room, I passed by the third and smallest island pod. With its signboard reading “Treasury of Truth”, the small building on the pod once served (and perhaps still does!) as the library for the monastic community and was not accessible the morning I was there. 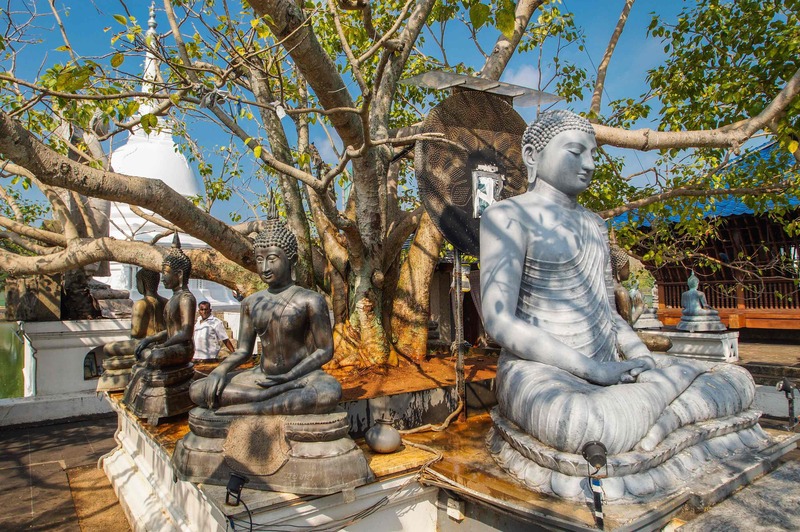 Once over the pontoon bridge and past the Parinirvana Buddha figure and the gigantic footprint (over a meter long! ), I looked back and I thought -“That was a great way to spend an hour”. 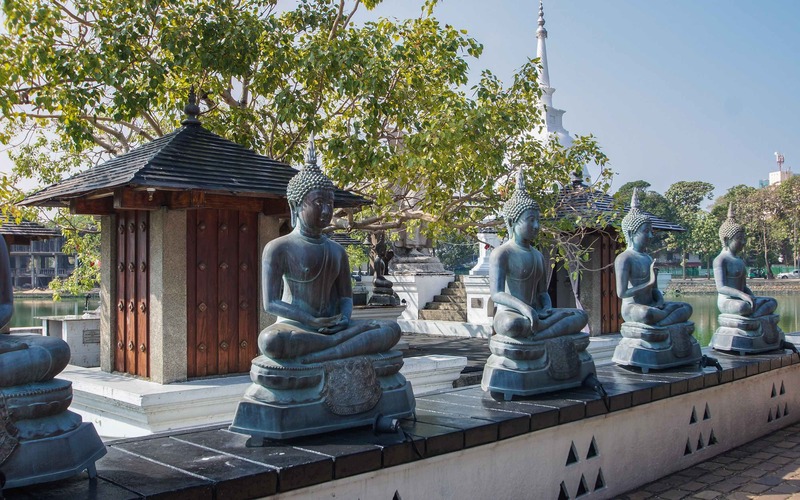 An hour and a half later I would have to revise that thought to include what was coming up – my visit to the main Gangarmaya Vihara complex just around the corner. 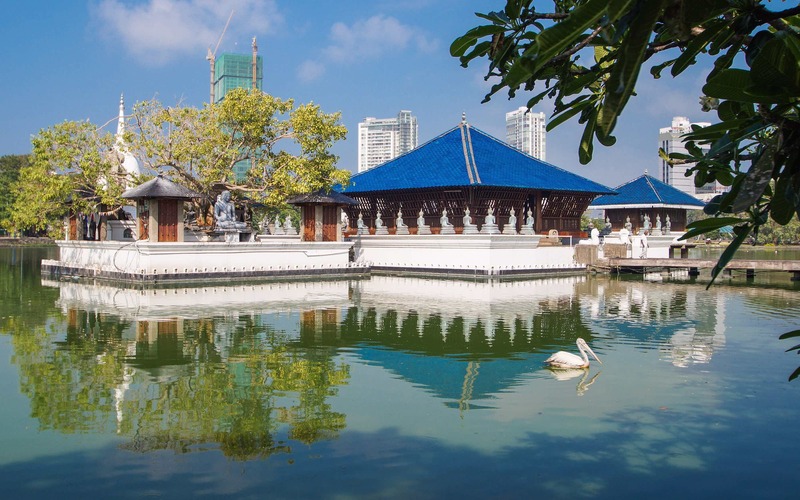 I didn’t know it yet but if the Seema Malaka was simple uncluttered Zen, then the main vihara was sensory overload Buddhist Baroque to the max!